the Q’eswachaka rope bridge, suspended over the apurímac river in peru, is a piece of living history. 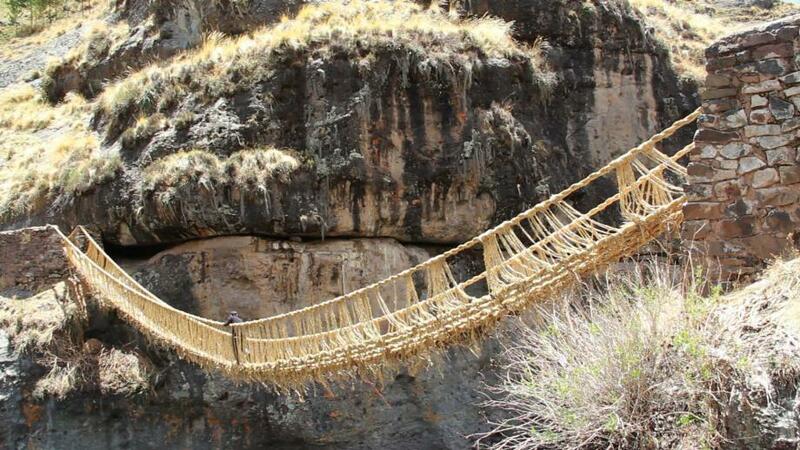 it is the last of the rope bridges that once connected the incan road system, and dates back about five centuries. rebuilt from twisted cords of grass by residents each year, it is a piece of history that is not only still in use, but regularly renewed. the bridge—spanning 118 feet and composed of local grasses—is remarkably sturdy: it can hold thousands of pounds of tension. but perhaps the most remarkable thing about the Q’eswachaka is the local community’s ongoing dedication to keeping it in working order. the bridge, though strong, only has a lifespan of one to two years before it begins to weaken. since the structure was first built nearly half a millennium ago, residents of nearby towns have fastidiously rebuilt it hundreds of times. they continue to rebuild it to this day, with each family contributing some 90 feet of rope. but to a place of shared responsibilities and benefits. Excellent, Beth. Love this post. Thank you for sharing such a cool story. Wonderful Beth – I love it. Careful though – that smacks of socialism and you could get in trouble with the Dina for publishing it. Beth-I can’t tell you how much this speaks to me right now. It so beautifully encapsulates things I’ve been trying to form in my head for weeks now. Thank you. i’m so glad. isn’t it interesting how things drop into our laps just when we need them? Love this photo. But not sure I’m brave enough to try this bridge! Thanks for sharing the post and the picture. me too, robin and it sure is! Frightening. You couldn’t get me to walk over that thing!! This is so impressive, but walking across it would scare me half to death! Exciting to know such piece of history still exists and that the locals are so determined to maintain it. Another very educational post. Where do you get all this interesting material? So glad that you are curious – and thanks very much for sharing what you learn, Beth! Community: (or dare I say Humanity?) where needs (for the good of all) surpasses wants (of a few)? That’s a cool story about the bridge, its history, present, and future. Thank you for sharing it, Beth. A post that hits on different levels. Thanks Beth. What a picture. The world is truly a fascinating place. Beth over at, I didn’t have my glasses on, shares this incredible story about a very old bridge. Even more amazing, to me, is the fact that generations of families and neighbours have maintained that bridge for 500 years. At a time where people struggle to maintain personal relationships and community ties, this bridge is evidence that long-term partnerships are not only possible, but can last a half millennia! Wow. The whole story fascinates. The age, and the commitment. Wonderful piece. An absolute delight for a bridge lover like me. Thanks so much for a great post. Wow. Have you been there Beth? This is terrific. I must share this with my daughter, as we learned about this in history class. A shame that none of the other bridges were maintained so fastidiously.